The stem cells are extracted by a special procedure from fat previously suctioned in a gentle, tissue-conserving manner. Based on our experience, even thin patients often have adequate fat deposits. The fat can be removed via a mini-liposuction from the abdomen or thigh region only, thus enabling simultaneous improvement of the body silhouette. There are no ethics issues with CAL breast enlargement since the stem cells are from the patients own autologous fat. There also zero risk of rejection with Cell Assisted Lipotransfer since it is the patients own biogenetic fat and stem cells. Does cell breast enhancement require general anesthesia? Is it still possible to breastfeed after a CAL breast augmentation? Is a hospital stay necessary after Cell Assisted Lipotransfer CAL breast enlargement? Can Cell Assisted Lipotransfer & CAL replace silicone implants? How long does CAL and Cell Assisted Lipotransfer breast enlargement take? How much does CAL and Mini CAL Cell Assisted Lipotransfer cost? The costs for a breast augmentation depend upon the procedure chosen (Mini Cal or Full Cal) along with availability of fat in certain areas (Abdomen and Thigh Area only ) of and the patient’s personal wishes and requirements. You will receive complete information on your custom cell assisted lipotransfer treatment, based on your particular needs. 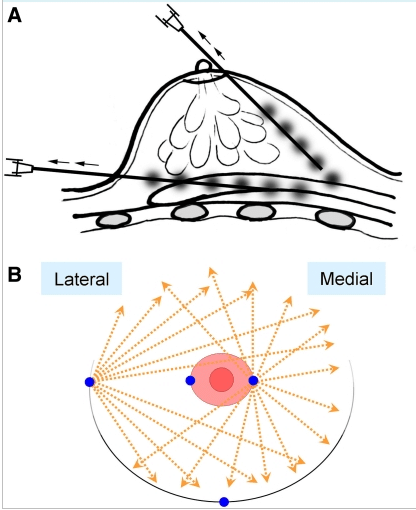 What increases in size are possible with Cell Assisted Lipotransfer? The breasts can naturally be increased anywhere from a 1 to 2 cup sizes (Full Cal) The stem cells are extracted from your own fat beforehand, the potential enlargement in a given case largely depends upon how large the body’s fat deposits are and how much volume the breasts can accommodate. The “flabbier” the breast is, the greater the volume that can be transplanted. For very taut breasts, pre stretching via our exclusive method, for example, may be advisable. Subsequent interventions are a possibility if the desired size cannot be achieved with one intervention. Can Cell Assisted Lipotransfer surgery make it harder to detect tumors? As with any breast surgery, small harmless calcifications may form afterwards. Experienced radiologists are now capable of distinguishing tumors from the harmless calcifications that may occur with stem cell breast augmentation in x-ray images. It is important that you tell all doctors treating you that you underwent the CAL or cell assisted lipotransfer procedure. Can Cell Assisted Lipotransfer make Breasts firmer? Can breast asymmetry be Corrected with CAL? What role do autologous stem cells play in CAL? 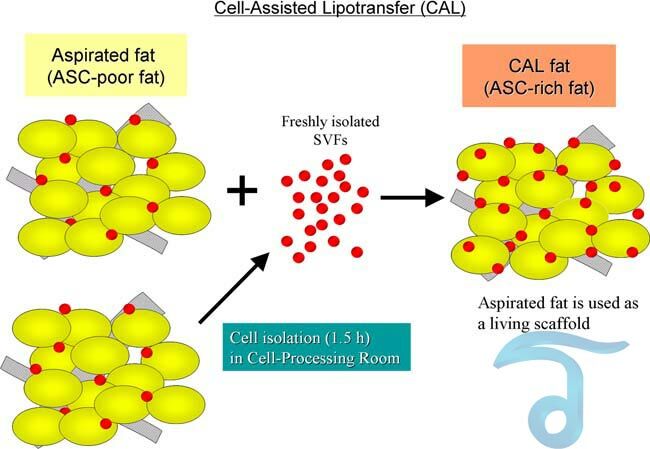 In stem cell assisted lipotransfer (CAL), a complex laboratory process is used to extract the stem cells from a portion of fat and add them to another portion of fat prior to implantation. 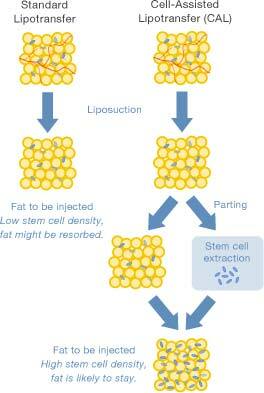 A considerably more sustainable result is achievable with this stem cell-enriched fat than with the other methods. With this method long-term volume retention is around 40-90% depending on the patients’ underlying health and habits. You can read more about the entire technique we use in here in Bangkok and the science behind this remarkable new treatment. Its published by Dr Kotaro Yoshimura (The inventor of this treatment). The medical journal and research paper can be read in full at the US National Library of Medicine National Institutes of Health. Please contact us today for more information about CAL Cell Assisted Lipotransfer breast enlargement in Thailand using Dr Kotaro Yoshimura’s patented technique in a closed-laboratory environment in Bangkok.